How to Create PDF from WPF? FoxPDF WordPerfect to PDF Converter, WordPerfect to PDF Converter, Convert WordPerfect to PDF, Convert WP5 to PDF, Convert WP6 to PDF, Convert WPF to PDF, Convert WPG to PDF, Convert WPG2 to PDF, WordPerfect to PDF, WP5 to PDF, WP6 to PDF, WPF to PDF, WPG to PDF, WPG2 to PDF etc. FoxPDF WordPerfect to PDF Converter let you batch convert WordPerfect(WP5,WP6,WPF,WPG,WPG2) to PDF without the need of WordPerfect. Batch convert WordPerfect (WP5,WP6,WPF,WPG,WPG2) to PDF without the need of WordPerfect. Featuring a rich program that lets you convert Word, Excel, WordPerfect, etc 500+ file format to PDF. How to Create PDF from WPF ? You can convert WordPerfect to PDF with FoxPDF WordPerfect to PDF Converter. You can convert WP5 to PDF with FoxPDF WordPerfect to PDF Converter. You can convert WP6 to PDF with FoxPDF WordPerfect to PDF Converter. You can convert WPF to PDF with FoxPDF WordPerfect to PDF Converter. 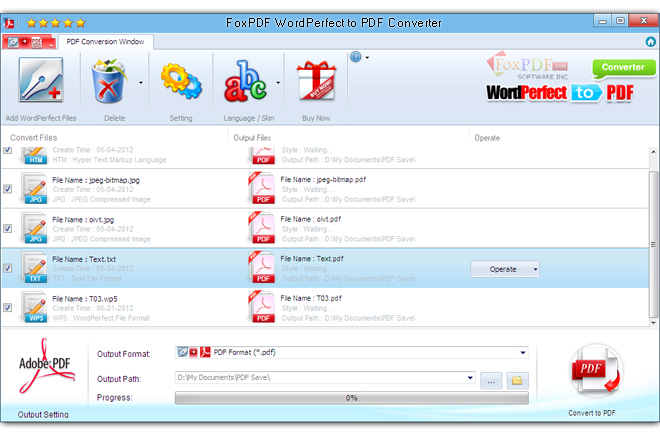 You can convert WPG to PDF with FoxPDF WordPerfect to PDF Converter. You can convert WPG2 to PDF with FoxPDF WordPerfect to PDF Converter. You can enjoy so many WordPerfect file convert to Adobe PDF Format, If you own expert pdf converter software from FoxPDF, FoxPDF WordPerfect to PDF Converter can also act as a convert any file to PDF Converter which can convert file to PDF with ease. The FoxPDF PDF Converter supports batch conversion, multithreading. 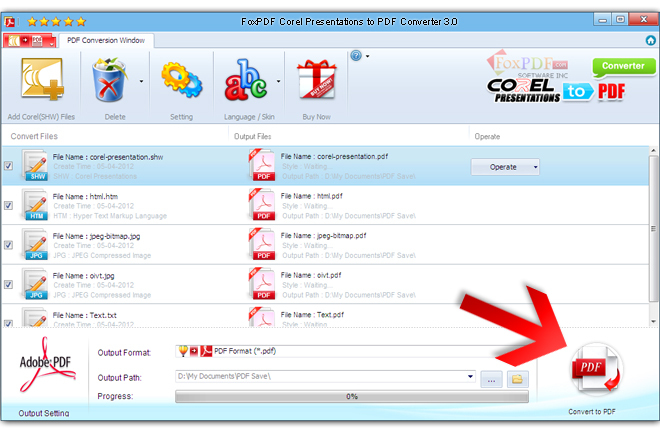 When convert all file to PDF, you can select the PDF Security and Language, set the output parameters. You can download it for Free Try WordPerfect to PDF Converter. In addition, the FoxPDF WordPerfect to PDF Converter can convert between other WordPerfect File Formats such as (WP5,WP6,WPF,WPG,WPG2), etc to PDF. Now let's focus on how to step by step convert WordPerfect(WP5,WP6,WPF,WPG,WPG2) to PDF with the FoxPDF WordPerfect to PDF Converter. Launch FoxPDF WordPerfect to PDF Converter, add your file by clicking "Add WordPerfect Files " in the main interface.